Simpler Newtonian 1-G velocities approximate the more accurate Einsteinian. Beyond Kuiper Belt (KB), we enter the vast space beyond the planets but well within the Solar System. EXAMPLE: 12.5 days of g-force acceleration can get us to near parts of KB. However, an entire year of g-force only gets us to about one third of the distance to the Oort Cloud. One year of g-force takes us to 23,800 AU. Compared to interplanetary (less than 100 AU), this distance is enormous; however, it is less than half way to the Oort Cloud, the physical border of the Solar System (usually considered to be 1 LY from Sol, our sun). Eventually, various space borne enterprises will form strong collectives with considerable inter-commerce. They will eventually realize the enormous practicality of using space resources for space requirements; Kuiper Belt will have plenty of raw materials (i.e., construction), but Oort Cloud comets have the extremely useful fluids. There will be an economic incentive to transport comets from Oort versus launching Earth's valuable water from Earth’s surface (bottom of Earth's gravity well). G-force vessel does a daily velocity increase toward c, light speed. Per Einstein, vessel observes same Δ everyday. measures vessel's ever increasing velocity. Thought Experiment (TE) assumes remainder exponential, (1-Δ)t , accurately predicts vessel velocities. Similar methods are used to compute radioactive half lives and certain probabilities. Einsteinian 1-G Velocities continuously approach but never reach c.
1. G-force acceleration daily increments ship's velocity, Δ = 0.283% c.
2. Paradoxically, all observers continue to measure light speed at constant value, c.
3. For any duration of one day (86,400 sec), g-force ship observers measure a velocity increase of .283% of observed c, light speed. This continues throughout the entire voyage. 4. Earth bound observers measure ship's ever increasing speed which approaches c but never reaches it. TE proposes exponential to compare ship's velocity against light speed, c.
For first few days of g-force travel, the Newtonian (incremental) and Einsteinian (exponential) produce similar results. However, after 365 days, they produce much different results. Thought experiment assumes the Einsteinian to be more accurate. TE assumes ship's propulsion system uses a particle accelerator with powerful magnets to manipulate plasma streams. Accelerator magnets guide and focus ions into a tight beam which exit the vessel for exhaust momentum. Extremely high speeds of these tiny particles will collectively propel ship forward at g-force. Accelerator magnets must be superconducting to consume much less energy then resistive magnets. Superconductor magnets will always be a necessary part of ship's onboard particle accelerator propulsion system. However, expanding range from interplanetary will increase trip time from days/weeks to months/years. This duration increase will need a significant design improvements. Almost 700 days of constant g-force finally gets our vessel to Oort Cloud. Flights to Oort Cloud (about 65,000 AU) will last much longer then flights to Kuiper Belt (40-100 AU away). Thus, energy efficiency will become much more important; even for superconductors. Onboard particle accelerators will require highly intense electro-magnetic fields which require extremely powerful electro-magnets which require kilometers of precisely manufactured and carefully wound wire (also known as “windings”). Traditional (aka “resistive”) electromagnets would require enormous amounts of energy to produce the required magnetic fields. Superconducting electromagnets are much more efficient and require much less energy; as a matter of fact, superconductor efficiencies are so significant that it’ll likely prove impossible to achieve g-force acceleration without them. Thought Experiment presumes we need a different way to compute g-force distances for distant destinations. Use calculus to derive distance equation. New Formula for Distance. Integrate velocity equation to determine the corresponding distance. Two Types of Superconductor Magnets. Cable-in-conduit conductors (CICC) magnets can turn off / on relatively easily. For example, they can ramp up from 0 to 15 Tesla in minutes. When magnetic fields change intensity, they create electrical currents in adjacent conductors; with current comes heat. CICC magnets can handle this heat because the superconducting wires are bathed in liquid helium. 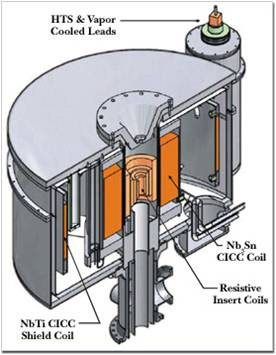 While CICC magnets are much more efficient then resistive magnets, they still use a small amount of power. For the short duration of interplanetary flights, this amount is almost inconsequential. G-force accelerated trips to near planets will take days and at most weeks. Thus, CICC type magnets prove more than adequate. Their slight energy consumption will be relatively inconsequential compared to high momentum exchange from near light speed exhaust particles. Wire-wound magnets will not need an outside power source during most of long voyage's powered flight. Ramp up may take weeks; however, when complete, wire-wound magnets disconnect from their power supply, because the superconducting current continues on its own. For longer flights, the wire wound type will be even more important because the greatly reduced energy consumption will prove significant for an acceleration period of many months and possibly years. but consumes small amount of power throughout the trip. Good for interplanetary trips inside KB. Longer voyages need something more. WW slowly ramps up but needs no additional power once there. This enormous gain in power efficiency would greatly benefit much longer voyages which will last months and perhaps years. A ship with WW superconductors would need to accommodate this ramp up period prior to takeoff. Thus, the preflight procedures might require a few weeks to ramp up; small price to pay for a trip which might take years. A ship with both types of superconductor magnet systems could start the voyage with CICC, then switch to WW after rampup process completes. However, thus, designers could implement a tradeoff between deleting preflight rampup period and adding considerable weight to facilitate a parallel magnet system. Perhaps extra magnets might be useful for more advanced starships. resultant momentum can propel a large spaceship at g-force. Use division: R= %TOGW/Δ to quickly approximate, useful range durations. Use Efficiency Factor: ε = 4, a static value to conveniently assume some practicality. Use Newtonian Motion Equation: d = g × t2/2 to quickly approximate acceleration distances. to exhaust particle mass (ffExh). capacity grows in correlation with particle exhaust velocity. 1) Increased velocity increases contribution to momentum exchange. 2) Relativistic velocities increases exhaust masses to further contribute. for one day of g-force. EXAMPLE: Let VExh be 86.6% light speed and arbitrarily assume perfect efficiency. At that speed, mass growth factor is 2.0 (i.e., mass doubles). Daily decrement of ship's mass is a small percentage of vessel's GW. Theoretical Range:Assume fuel to be 100% of ship's GW (all fuel). Feasible Range: assume ship's fuel between 10%-90% of GW. For this example, let initial fuel be 40% of ship's initial GW. Practical Range: Assume much less than perfect efficiency (E=100%). For inner planetary, let E=25% and efficiency factor be 4 (ε = 1/E = 4). Approximate: RPrac ≈ 40%/(ε Δ) = 40%/(4 × 0.163%/day) = 61.35 days. Recall 4 phases of a typical g-force voyage. In brief, 1) Phase 1 is acceleration from departure to midpoint, 2) deceleration from midpoint to destination; returning from destination to departure, 3) is acceleration from destination back to midpt, 4) final phase is deceleration from midpt back to departure. Since all 4 phases are equal time/distance, Thought Experiment assumes one fourth of practical range is available for Phase 1, acceleration time, tAcc. Phase I Acceleration Time (tAcc): Previous tables show value derived from Particle Exhaust velocity. In turn, this value is basis for following terms. Phase I Acceleration Distance (dAcc): ... can be closely approximated via Newtonian method: dAcc = g × (tAcc)²/2. Let g be acceleration due to gravity, g = 9.8065 m/sec² = 0.489 AU/day². Thus, total distance to destination is double the distance to midway. G-force performance can be measured by particle exhaust velocity (VExh). For inner planets, exhaust velocities from .1c to .866c generate propulsion range in excess of 30 days. describes velocity of exhaust particles. Previous tables show how increasing exhaust particle velocity increases range of g-force vessel in both duration and distance. Increasing particle velocity to .866c gives vessel a range over 30 days of g-force which can take it well past Kuiper Belt. Extraplanetary tables will use Einsteinian methods for increased performance. Daily increment(Δ): 1 day of g-force gains velocity equal to this percentage of c.
As with trains, planes and automobiles, g-force vessel's GW decreases with fuel consumption. How do we compute ever decreasing Gross Weight (GW)? Daily Decremental Model is an intuitive model which approximates fuel comsumptions. Following intuitive consumption model could approximate first few days. If a day of g-force propulsion requires 0.652% of vessel's initial Gross Weight (GW0); then, first few days (0, 1, 2, 3, ..., t) of g-force travel would respectively consume following approximate amounts: 0%GW0, 0.652% GW0, 1.304% GW0, 1.956%GW0, ...., 0.652%GW0 × t. Finally, ever decreasing GWs could be approximated by following values: 100%GW0, (100-0.652)% GW0, (100-1.304)% GW0, (100-1.956)%GW0, ...., (100-0.652×t)%GW0. EXAMPLE PROBLEM: If original fuel is 40% of ship's original GW, what is ship's range? Let daily differential of ship's GW (Δ) continue to be 0.17% GW0. Intuition leads us to approximate range by dividing original fuel by Δ. Thus, Approximate Range (RApp) is 40%/Δ = 40%/0.652% per day =61.35 days. GW is Gross Weight of vessel, units are in percentages of original GW. GW0 is Original GW of vessel, prior to starting powered flight. GWt is Daily GW of vessel, measured at start of day, t.
t is time, expressed as days of powered, g-force flight. Δ is daily diff (%GW) between any two consecutive days. the additional fuel consumption needed to overcome inefficiency. resultant momentum can propel an even larger spaceship at g-force for a much longer duration. Outer Planetary Ranges has some key differences from the Inner Planetary Table. Use logarithms: R= log(1-%TOGW)/log(1-Δ) for more accurate, useful range durations. Use Efficiency Factor: ε = 41/(mr-1), an arbitrary, dynamic model which assumes continuous performance improvement. Use Einsteinian G-Force Equation: d(t) = c×tAcc + V(t) / ln(1-Δ) for more accurate, useful distances. as a series of integers. EXAMPLE: Let relativity growth factor, mr, be 5 and arbitrarily assume perfect efficiency. is a small percentage of vessel's GW. Computed Feasible Range: Like "Inner Planets", let initial fuel (%TOGW) be 40% of ship's initial GW. However, use a much different method (logarithms) to better model range durations. EXAMPLE: Let relativity mass growth (mr) = 6. Efficiency Factor, ε, of ship's propulsion system. TE uses an arbitrary function to generate dynamic values which map to mr values. Actual efficiency factors will eventually come from observations of actual propulsion systems. Computed Practical Range: TE assumes Efficiency (E) will ever approach but never reach perfection (E = 100%)..Thus, TE assumes efficiency improves as propulsion performance improves (increasing value of mr). Einsteinian Velocity: Δ is daily progress of g-force vessel toward light speed, c.
Phase I Acceleration Distance (dAcc): ... Calculus gives us distance solution. Phase II Deceleration Time (tDec): To maintain g-force, deceleration duration must be same as for acceleration (Phase I). Total Time Destination (tTtl): Double acceleration duration from Phase I. This includes acceleration time from departure to midpoint and deceleration from midway to destination. Total Distance Destination (dTtl): Double acceleration distance from Phase I which sums acceleration distance plus deceleration distance.. Note this distance is much less than distance achieved by g-force acceleration for same time. G-force performance can be measured by relativistic mass growth (mr). For Oort Cloud, mr values 2 to 10 generate propulsion ranges exceeding 52,000 AUs. Fuel consumption reduces ship's Gross Weight (GW). Let daily decrement (Δ) be fuel consumed for one day of g-force propulsion. EXAMPLE: if Δ = .163% GW; then, vessel's will decrease by .163% in one day. For subsequent days of powered flight, vessel's GW will continue to shrink. For the lengthier voyages, the precise exponential model yields much more encouraging results than the daily decremental model.